Other Common Names: Ekmossa (Swedish), mousse de chêne (French), Eichenmoss (German). Habitat: Oakmoss is widespread throughout Europe, North Africa, Asia and North America. Description: Evernia prunastri or oakmoss is a lichen of the Parmeliaceae family. The genus Evernia contains about ten different species. The thalli (the vegetative body of a lichen) are bush-shaped and grow together to form large clumps. 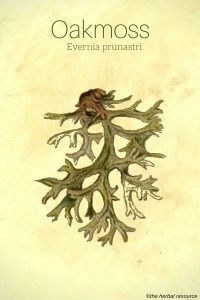 The thallus is flat and highly branched. It grows on trunks and branches of shrubs and deciduous trees like oaks, fruit trees, and blackthorn but also sometimes on pine trees. It is green to light whitish-green when dry, and dark green to yellow-green when wet. Oakmoss resembles tree moss (Pseudevernia furfuracea) and old man’s beard (Usnea spp.) and it is very sensitive to air pollution. Plant Parts Used: The whole thallus is used and is treated in various ways to extract the aromatic substances. Approximately 9,000 tons of oakmoss are collected annually, usually from the cork oak (Quercus suber L.) and fruit trees. The lichen is collected mainly in Central and Southern Europe but also in Morocco and Algeria. Oakmoss contains the substances lichenol, chloroatranol, and atranol to name only a few. The essential oil has antiseptic, emollient and expectorant properties. Oakmoss has never played a big role in herbal medicine and it is not mentioned much in the available literature on medicinal herbs. There is still some references to its use in aromatherapy to treat a headache or sinusitis. 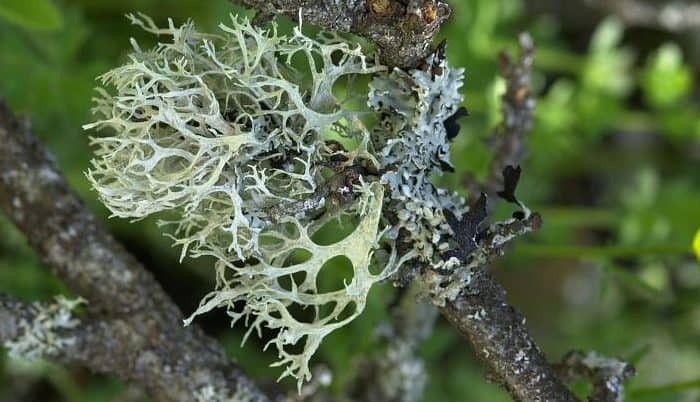 The fragrant substances of this lichen are widely used in the perfume industry and it is also an excellent fixative (a stabilizing or preservative agent) for other fragrances. When oakmoss is collected for use in aromatic products it is often intermingled with tree moss (Pseudevernia furfuracea), either deliberately or as a “contaminant”. Tree moss is more aromatic than oakmoss but inferior as a perfume fixative. In ancient times it was imported from Greece and Cyprus to Egypt and used in wrappings of embalmed mummies. Traces of the herb have been found in graves dated back to ca. 1900 B.C. The lichen has been used as a perfume agent at least since the 1300’s. In the 1500’s it was common throughout Europe as a fragrance material in sachets (small cloth scented bag filled with herbs and aromatic ingredients) and also in powdered form to powder wigs. From the mid-1700’s the lichen was used in the form of tincture in (alcohol-based) perfumes. It has been used as a leavening agent in dough making and also as a seasoning in bread (sourdough bread). Additionally it has been used instead of hops (Humulus lupulus) in beer. Extracts of the lichen are used to some extent for seasoning in the food industry. So far there is no established therapeutic dose of oakmoss as an herbal medicine. It should be avoided by people with known skin sensitization issues and it is usually not recommended for internal use. Rose, Jeanne: 375 Essential Oils and Hydrosols. Berkeley. Frog, Ltd. North Atlantic Books 1999. Lawless, Julia: The Illustrated Encyclopedia of Essential Oils. Shaftesbury. Element Books 1995. Bown, Deni: Herbal. The Essential Guide to Herbs for Living. London, England. Pavilion Books Limited 2003.